What is it about steel pan music that stops me in my tracks? 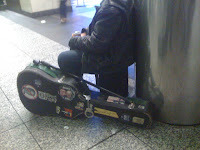 This was the question I posted to my Facebook status last week after stumbling on a steel pan musician at Penn Station. The melodies he coaxed from the steel pan made me pause, and I went digging for the change in my pocket, something that I rarely do. Steel pan music reminds me of my heritage—something that Facebook users were quick to point out, referencing both a longing for home and my nationality as reasons for feeling this connection. Music has this power—to recall a memory, to transport us, to connect us. My first social science endeavor dealt with music. I had an English teacher in high school who was young and enthusiastic; his ideas didn't always jive with the administration. For example, he learned that our school bell system could be programmed to play music instead of tones. He managed to persuade the administration to permit the bell system to be modified: instead of a tone to signal the end and beginning of classes and three minutes of silence during the passing, there would be three minutes of music to accompany students during the passing between classes. The exercise was over relatively quickly—the administration found the music disruptive. Teachers felt they had trouble getting their students settled down for the lesson. 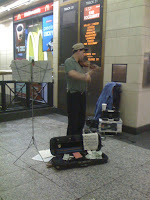 At the time, I was reading about the use of music to relieve stress. There have been studies done linking reduced levels of cortisol (a stress hormone) to exposure to music. I remember being particularly intrigued by reports of surgeons piping in music to ease their (and their patient's) anxieties about the process. It kept them relaxed. Of course, this isn't really new information. There's a reason music is played in fast food establishments and in shopping malls: more than just background noise, it sets a mood. Holiday shoppers are more likely to spend if they are feeling like its a "Holly Jolly Christmas" and people tend to eat more when there is slow, sad music in the background. If there was evidence that music influences mood, and it was being used to this effect by larger parties, then could it have a benefit in schools? Beyond creating unruly, distracted students, that is? Possibly. If surgeons were using music to calm their nerves, then perhaps I could make an argument about productivity. The study I designed used classical music during passing, and teachers reported through qualitative assessments that students seemed more relaxed and productive. The administration would not permit quantitative analysis, which I proposed could be done through examining test scores (collected with all identifying information removed, of course.) I tested this hypothesis in three high schools, and the results were the same—music has a effect on mood which could be linked to productivity, but the question of why remained unanswered—how can music manipulate the collective? "The truth is that his poetry, though startling at first, leaves a delightful feeling of convalescence in the soul tormented by the diminishment of the universe. He creates his own grammar and logic. He reads the eye of an ox and the sap in the leaf." To the greatest number of free men and workers the Earth has ever seen corresponds a poetry of wholeness and faith, grave and soothing, that rises like the Sun from the sea, setting the clouds ablaze, edging the crests of the waves in fires, and rousing the nestlings and the drowsy, flowers in the teeming jungles along the shore ... everything breathes out its own music. Literature—which announces and propagates the final, joyous concordance of apparent contradictions ... Literature, which inculcates men's fearful spirits with a conviction so rooted in definitive justice and beauty that the penuries and uglinesses of existence do not dishearten or embitter them—will not only reveal a form of society that is closer to perfection than any now known, but will also, by felicitously conjoining reason and grace, provide Humanity, ever eager for marvels and poetry with the religion it has awaited in bewilderment since it became aware of the emptiness and insufficiency if its ancient creeds. Have a favorite song? How does it make you feel? Remember the fight song from you alma mater? What was the effect on the crowd? Talk back below. 2002 "The Poet Walt Whitman." In Selected Writings. Esther Allen, ed. New York: Penguin Books. Your article is very insightfull. I agree that people react to music which is familiar to them. But also people are curious about new sounds, which take them by surprise. Did you ever see the 'Saw Lady' at the Union Square subway station? People of all colors, ages, religions, etc., stop to talk with her. They are all intrigued about the sounds she makes, playing the musical saw. 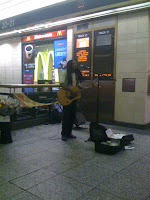 Her sound is very calming (like meditation), and everybody starts to smile. 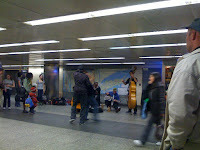 She keeps a blog where she tells what happens when she plays in the subway: www.sawlady.com/blog You might find it interesting to see what people say to her as she plays in the subway. Thanks friendsofmusic! You make an excellent point about curiosity. I DO know the "Saw Lady"—I had never seen a musical saw before. I'm delighted by her blog, and the way she tracks her interactions with subway personnel and passengers. From her posts, it's clear that sound is an integral aspect of our relationship to our environment and to each other. I'm am also intrigued by her status as a fixture, though of course as you become a part of your environment, you're likely to interact with it, and the subway seems to be her domain. Her music provides a conduit for people to connect to her. It appears that she has quite a sphere of influence also since several people indicate that they have told others about her.